Reset service light indicator Audi A2. From years: 2000, 2001, 2002, 2003, 2004, 2005. 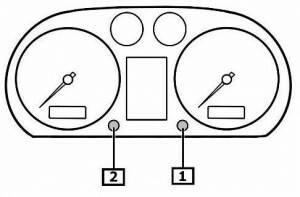 Start with the ignition turned ON (position 2), but with the engine OFF. Pull out and hold the button on the right (1) side of the display until SERVICE appears on the display. Release the button on the right (1), then within 5 seconds pull the button out and hold it again. Release the button when the display shows ,barm or SERVICE IN xxxx Miles / Kilometres, xxxx days. Then press button on the left (2), to reset the display. Then you will see the words Service in ….. km. 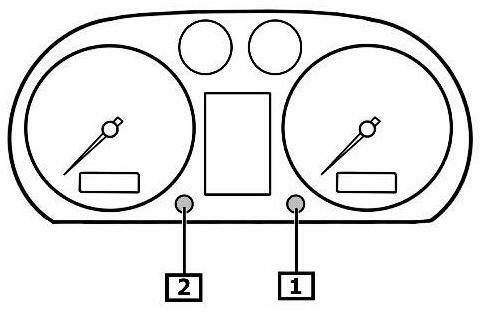 That it is the full procedure how to reset service light indicator Audi A2. If you like to reset any maintenance oil light after an oil change. Or reset check engine light, airbag light, inspection key or insp errors when maint reqd, for Audi cars. Or any error which appears on the display, write in the search box the car name for which you want to find information, and find how to reset other service reminders when by yourself. This is an information site where you can solve your car problems. Send us a comment if our procedures are correctly or if you would have anything to add, for us every opinion counts.